What’s Amazon’s Most Popular Kindle? I’ve been studying Amazon’s best-seller lists, trying to figure out which Amazon products are the most popular. Each hour, Amazon updates the lists for each category — including the “Electronics” department, where all their Kindles are listed. I realized today that it’s a great source of information about the new Kindles. 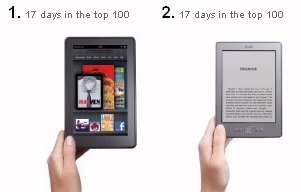 And it seems to offer a definitive answer to the question: which of Amazon’s new Kindles is the most popular? It’s their full-color touchscreen Kindle Fire tablet. In fact, it’s the #1 best-seller in Amazon’s entire electronics section — even though it’s also one of Amazon’s most expensive Kindles ever. But the #2 best-selling Kindle — both last week and this week — is Amazon’s least expensive Kindle ever. It’s the $79 Kindle, which ships with sponsored screensavers and “Special Offers”, and it seems to settle the question as to whether customers would accept ads on their Kindles in order to get a cheaper price. This isn’t just a temporary phenomenon. I checked this list one week ago, and its rankings were exactly the same for the top four best-selling Kindles. In fact, since they were released 17 days ago, all Amazon’s new Kindles have stayed on their list of the top 100 best-selling electronics products. But it gets more interesting when you realize how many other versions there are of the new Kindles — and watch how they’ve fluctuated up and down on the list. #5 is now the 3G version of the Kindle Touch (with Special Offers). Apparently even consumers who were willing to pay a little more for 3G connectivity still wanted to save money by buying the Special Offers version. Even a week ago, it was still in the #7 spot, and you’ll see the same trend in the #6 best-selling Kindle. It’s the 3G version of the Kindle Keyboard with advertising, proving that even consumers who were willing to pay a little more for 3G connectivity still wanted to save money by buying the Special Offers version. But the #7 spot went to the international version of the WiFi-only basic Kindle without advertisements. And last week, it was in the #5 spot — so there’s still a few bargain hunters who just won’t buy a Kindle if it’s got advertising. Confirming that trend, the #8 spot — both this week and last week — is the cheaper WiFi-only version of the Kindle Keyboard without advertisements. Some shoppers were willing to forgo 3G connectivity — but not the ability to own a Kindle without advertising. In fact, the #11 best-selling Kindle this week is also the ad-free version of the WiFi-only basic Kindle (for $109) — the non-international version. 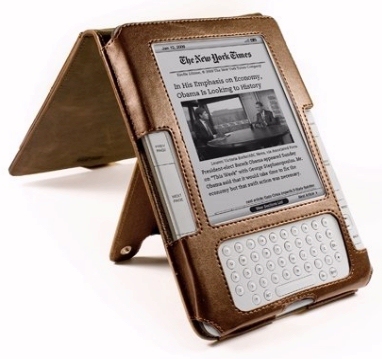 But the ad-hating consumers seem to represent a smaller piece of the Kindle market. Proving this, I see that one Kindle has dropped out of the top ten altogether. The #9 best-selling Kindle used to be the ad-free, 3G version of the Kindle Keyboard at $189. This week, it’s fallen all the way to the #12 spot. And I had to laugh when I saw which product claimed the last two slots in top 10. Apple’s iPod touch has now claimed both those spots — #9 for the 8-gigabyte version, and #10 for the 32-gigabyte version. I’ve been writing about Apple’s fight for dominance in the tablet market , and it looks like on Amazon’s best-seller list, you can watch it happening in real time. Last week, there was only only non-Kindle product in the top 10 — and it wasn’t from Apple. Instead, the #10 spot went to Garmin’s 5-Inch Portable GPS Navigator (whic this week is #13). Of course, the lists can’t tell you how many Kindles have been sold — but it’s still a fun source of other trivia. For example, I think it’s amazing that the Kindle Keyboard has now racked up reviews from over 32,990 people! I wonder how many reviews the Kindle Fire tablets will have one year from today? It’s not actually true that the Fire is the most expensive kindle ever. . .the original kindle was $399 when it was released in November of 2007. The price had dropped to $259 by the time the 2nd generation kindle was released in February of 2009. The 3rd Gen device was the first to break the $200 mark — that was August 2010. And of course the DX is still well over $300.